(WASHINGTON, DC) -- Republican presidential candidate U.S. Senator John McCain today unveiled his Presidential campaign web page. 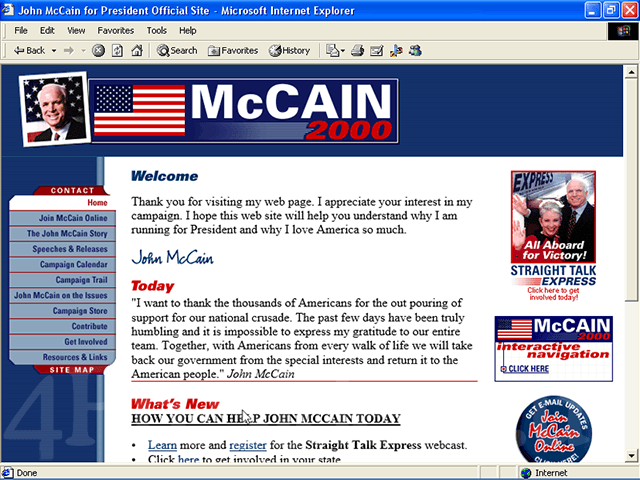 The site is located at www.mccain2000.com. "I'm excited my campaign is making use of the cutting edge in communications technology," said McCain, who yesterday also participated in the first online chat of his campaign. "My web site offers the latest features to help supporters, committed or potential, as well as reporters, students and the just plain curious." "The Internet provides us with a new and exciting opportunity to communicate directly with voters," said McCain. "Each of us can now become better informed and more closely involved with candidates and their positions on the issues. Using sites like mine, citizens young and old can find the information they need to make more educated choices about their leaders." McCain's site offers biographical video of the Senator's stirring life story, as well as clear statements of his stands on the important issues of the day. Major speeches as well as the Senator's campaign schedule and press releases are also available at the site. Supporters will also able to volunteer their time, donate money and request campaign paraphernalia. McCain, Chairman of the Senate Commerce, Science and Transportation Committee, has been a national leader on communications technology policy and last year he spearheaded the successful Internet tax moratorium. He currently is sponsoring legislation to address the Y2K bug. Following is the text of Republican presidential candidate U.S. Senator John McCain's announcement speech. I have the privilege of beginning my campaign with you here in New Hampshire, but I began this day as I began my career of service to our nation...in the company of United States Naval Academy midshipmen. for me to have begun this mission than Annapolis. I do not announce my candidacy to satisfy my personal ambitions. My life has already been blessed more than I deserve. I don't begin this mission with any sense of entitlement. America doesn't owe me anything. I am the son and grandson of Navy admirals, and I was born into America's service. It wasn't until I was deprived of her company that I fell in love with America. And it has been my honor to serve her and her great cause - freedom. I have never lived a day since that I wasn't thankful for the privilege. It is because I owe America more than she has ever owed me that I am a candidate for President of the United States. I run for President because I want to return our government back to whom it belongs—the people. So that Americans can believe once again that public service is a summons to duty and not a lifetime of privilege. and our children will be asked to defend. our destiny, we will abandon the cause our founding fathers called glorious. The first responsibility of the next president will be keep our country safe so that we might secure for ourselves and humanity a future worthy of our highest aspirations. That obligation requires a commander-in-chief who has the experience to understand and lead a volatile and changing world. prosperous nation and a world free of the tyranny that has made the passing century such a violent age. This is a great and worthy cause that beckons us all. It is bigger than any one of us. It is larger than personal ambition. It is more important than self-seeking. At a young age I discovered how liberating it is to sacrifice with others for a cause greater than self-interest. I run for President because I want the next generation of Americans to know the sense of pride and purpose of serving a cause greater than themselves. I entered politics with the same expectations I had when I was commissioned an ensign in the Navy. First among them was my belief that serving my country is an honor, indeed, the most honorable life an American can lead. in my power to make you proud of your government. Something has gone terribly wrong when parents no longer want their children to grow up to be President. That shames me, that shames me. And I want to do something about it. When our government has been taken from us by the special interests, the big-dollar donors, pride is lost to shame. When our politics are corrupted by money and lies, trust is lost to cynicism. We have a choice. We can continue to watch as the American people grow ever more alienated from the practice and institutions of democracy. We can continue to tolerate a government that has become little more than a spectacle of selfish ambition, a government auctioned to the highest bidder. Or, we can take a stand. not only the most effective form of government, but the only moral government. fight to take our government back from the power-brokers and special interests, and return it to the people, and the noble cause of freedom it was created to serve. If we are to meet the challenges of our time, we must take the corrupting influence of special interest money out of politics. Restoring honesty to our political system is the gateway through which all other policy reforms must pass. To make our schools better, we must reduce the influence of the teachers unions and their lobbyists. To improve our health care system, we must rein in the power of trial lawyers and the influence of insurance companies. And once we win our government back, there is no limit to what we can accomplish. If elected President, I will not allow your Social Security money to be used for any purpose except Social Security -- no ifs, ands, or excuses. Social Security money will be taken completely off budget - every single dollar. So politicians can't get their hands on your retirement money to finance another big government scheme. the big-dollar donors, but for the working men and women of this country. I will repeal the indefensible tax penalty that punishes couples who want to get married. I will slash the inheritance tax that penalizes those who wish to leave the fruits of their labor to their children. I will end the earnings test penalty for seniors that taxes their income twice and denies them the self-respect that comes from working. And I will dramatically increase the number of Americans who qualify for the lowest tax rate of fifteen percent by raising the eligible income to $70,000 per couple. Day after day, I have fought to stop Congress from treating your money like lottery winnings. I want you to know, what every member of Congress knows, that if I am President, I will refuse to sign any pork barrel bill that crosses my desk. And if Congress overrides my veto and tries to force me to waste your money, I'll make sure you know who they are - every single one of them. Fixing a broken political system is the key to necessary reform in almost every area where the government touches your life. But nowhere are the stakes greater than in the education of our children. Washington bureaucrats. Let's put your child's education back in the hands of someone who knows your child's name. It's time that we encourage and reward excellence, for students and teachers alike. have the control to require it. Every child in every classroom deserves a teacher who is qualified and enthusiastic about teaching. Some people just aren't meant to be teachers, and we should help them find another line of work. Because if teachers can't teach, our kids can't learn. have -- to send their child to the school that best meets their needs. It's time to conduct a nationwide test of school vouchers. It's time to democratize education. neighborhoods will have access to the same information. The blessings of technology give us the means to breach the walls of ignorance and isolation. At the dawn of a new American century we face the prospect of reaching the full promise of our founding ideal that all men are created equal by giving all Americans access to information and knowledge, and an equal opportunity not only to pursue, but to attain happiness. Education is the great equalizer and used wisely, the information revolution will hasten the end of a two-tiered society of haves and have nots, and advance human freedom into the even the darkest corners of tyranny. every part of American society to continue the American experiment and promote the American cause in a still dangerous world. There is no safe alternative to American leadership. The history of this violent century has surely taught us that. We cannot hide behind empty threats, false promises, meaningless rhetoric, and photo op diplomacy. We must confidently defend our interests and values wherever they are threatened. And the first priority of our world leadership is to protect our own security. systems and other pork projects while 12,000 enlisted personnel, proud young men and women, subsist on food stamps. And we shortchange those priorities most vital to our security, including training, missile defense, weapons modernization, and counter-terrorism. relinquished our sovereignty. It means we have persuaded much of the world to share our ideals. And that's not a cause for concern. It's a cause for hope. We Americans are a strong confident people. We know that in open competition our ideals, our ingenuity, and our courage ensure our success. Isolationism and protectionism are a fool's errand. We should build no walls in a futile attempt to keep the world at bay. Walls are for cowards, not for us. solemn responsibility given the President is the role of Commander-in-Chief. leader can no longer rely on briefing books and talking points, when the experts and the advisors have all weighed in, when the sum total of one's life becomes the foundation from which he or she makes the decisions that determine the future of our democracy. involved in the decision, the President is a lonely man in a dark room when the casualty reports come in. I am not afraid of the burden. I know both the blessing and the price of freedom. I am not afraid. I have faith in my country and the good men and women of every American generation who know the honor of defending our cause. I am not afraid. I learned long ago how powerful America is when she has the courage of her convictions. I am not afraid. My life has taught me that the strength and courage of others will always help sustain me in an hour of need. I am not afraid, because I know that, as we prepare to take on the challenges of the next century, enough Americans will serve together a glorious cause greater than our narrow self-interests. There are have always been those who question the moral imperative of American government and diplomacy. They are profoundly wrong. We embrace the virtues of inclusion in our party and in politics but we hold firm to our core national values. We are all part of a great experiment: that people who are free to act in their own interests will perceive their interests in an enlightened way, and will gratefully accept the obligation of freedom to make of our wealth and power a civilization for the ages, a civilization in which all people share in the promise of freedom. "We hold these truths to be self-evident: that all men are created equal, that they are endowed by their Creator with certain unalienable rights, that among these are life, liberty and the pursuit of happiness." I want to be President to protect, until my life's end, our magnificent dream of freedom - God's great blessing to the world. And with your help I will. We knew when we began this campaign that ours was a difficult challenge. Last Tuesday, that challenge became considerably more difficult as a majority of Republican voters made clear that their preference for President is Governor Bush. I respect their decision and I am truly grateful for the distinct privilege of even being considered for the highest office in this, the greatest nation in the history of mankind. Therefore, I announce today, on this fine Arizona morning, and in this beautiful place, that I am no longer an active candidate for my party's nomination for President. I congratulate Governor Bush and wish him and him family well. He very well may become the next President of the United States. That is an honor accorded to very few, and it is such a great responsibility that he deserves the best wishes of every American. He certainly has mine. I am suspending my campaign so that Cindy and I can take some time to reflect on our recent experiences, and determine how we can best continue to serve the country, and help bring about the changes to the practices and institutions of our great democracy that are the purpose of our campaign. For we believe these changes are essential to ensuring the continued success of the American experiment, and keeping America in this new century as bright a beacon of hope for mankind as it was in the last. I hoped our campaign would be a force for change in the Republican Party, and I believe we have indeed set a course that will ultimately prevail in making our party as big as the country we serve. Millions of Americans have rallied to our banner, and their support not just honors me, but has ignited the cause of reform, a cause far greater and more important than the ambitions of any single candidate. I love my party, it is my home. Ours is the party of Lincoln, Roosevelt and Reagan. That is good company for any American to keep. And it is a distinct privilege to serve the same cause that those great Americans dedicated their lives to. But I am also dedicated to the necessary cause of reform, and I will never walk away from a fight for what I know is right and just for our country. As I said throughout the campaign, what is good for my country, is good for my party. Should our party ever abandon this principle, the American people will rightly abandon us, and we will surely slip into the mists of history, deserving the allegiance of none. So, I will take our crusade back to the United States Senate, and I will keep fighting to give the government back to the people; to keep our promises to young and old alike by paying our debts, saving Social Security and Medicare, and reforming a tax code that benefits the powerful few at the expense of the many. And with your help, my fellow Americans, we will keep trying to force open doors where there are walls to your full participation in the great enterprises of our democracy; be they walls of cynicism, or intolerance, or walls raised by a self-interested elite who would exclude your voice from their highest councils of our government. I want to take a final moment to speak to all those who joined our party to support our campaign, many of whom voted in this election for the first time. Thank you. Thank you from the bottom of my heart. Your support means more to me than I can ever say. But I ask from you one last promise. Promise me that you will never give up, that you will continue your service in the worthy cause of revitalizing our democracy. Our crusade will never accomplish all its goals if your voices fall silent in our national debate. You are and always will be the best thing about this campaign, and the best hope for our country's future success. Stay in this fight with us, we need your service as much as ever. Millions of Americans over the years have by their example showed us that America and her causes are worth dying for. Surely she is worth living for. That is what I ask all of Americans who found in our campaign an expression for their patriotism. I am so proud of you, and so grateful for your company. I have been in my country's service since I was seventeen years old. I neither know nor want any other life, for I can find no greater honor than service. You served your country in this campaign by fighting for the causes that will sustain America's greatness. Keep fighting, my friends, keep fighting. America needs you. Thank you, my friends, thank you so much for helping me remember what it means to be a public servant in this, the most blessed, and most important nation on earth. It has been the greatest privilege of my life.